Wedding party introductions can be pretty insane! We have to be ready to expect some crazy things to happen! Keith and Dana had their wedding at Salvatore's Italian Gardens in January 2017! It was a very snowy and cold day. Amazing weather for magical photos though! I guess you can tell this was during the presidential election! 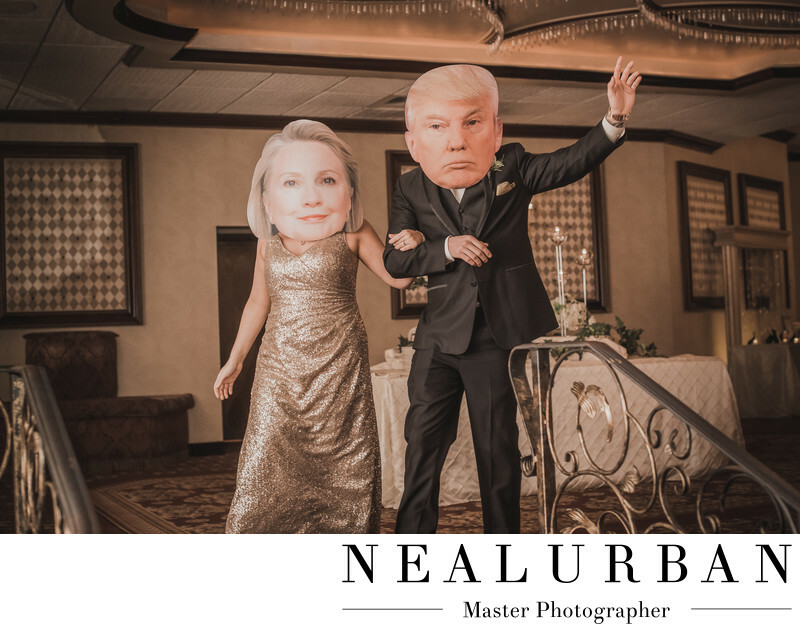 Hillary Clinton and Donald Trump made an appearance! We have not heard a group of guests laugh this loud in a long time. This was pretty funny. Neal and I were laughing as we were taking photos. This was one of the best intros we had seen in a while! To make the night even more interesting, these masks made it out onto the dance floor later in the night. Random guests had them on throughout the night! The photos were hysterical! They had such a fun party too! The dance floor was packed the entire night! I do not even think the DJ really played too many slow songs because the guests were going so strong. At the end of the night, we thought about using these masks for Keith and Dana for a photo, but decided against it. We ended the night in the Salvatore's parking lot in a winter wonderland! It was breath taking! Location: 6461 Transit Rd. Depew NY 14043 United States .